I went from a 3' diameter circle to a 4'x10' raised bed over the weekend! I'm tired from hauling dirt, but satisfied as well. I layed cardboard out beforehand to kill the grass/weeds, and layed down several layers of newspaper, as well as what little half-finished compost I had in my pile. Then I added dirt on top of that. Sort of sheet composting, lol. I wanted to have it ready for my fall greens I'm going to try. I'll snap a few pics when I get home from work. I'm addicted. I'm already looking at other places in the yard to convert. Yes it is hard not too keep growing. I am in a newer house and have been expanding every year sometimes twice a year getting a bed ready for next year. But EG don't overgrow your britches too fast or you may become flustered and want to give up. A little at a time is good. But in my case I say screw that I want more more more. That's what I did. I started small, and was immediately disappointed when I ran out of room. But, I kept up with it, and in the texas summer heat that's impressive, so I feel like I can go a little bigger. This fall/winter, if i can do the bigger garden, in spring I'll move the small circle border that was my starter garden and do both of them until I go nuts and expand everywhere. Hubby likes it, less to mow. Welcome to the club. I don't think there's a gardener here who doesn't think from time to time that a stand of corn would look much better than that "regular grass" that's growing in the front lawn now . I've gardened for many years, but when I decided to go the raised bed route; I started like you with one 4' X 8' bed. Then I added another. Then I added two more. Then I added a 3' X 24' bed. Now I've added two 3' X 8' beds. I'm looking at a fence around my garden and wondering if a really narrow bed along the fence will work. It's addictive and it may never stop. 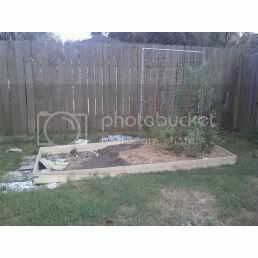 tedln wrote: I've gardened for many years, but when I decided to go the raised bed route; I started like you with one 4' X 8' bed. Then I added another. Then I added two more. Then I added a 3' X 24' bed. Now I've added two 3' X 8' beds. I'm looking at a fence around my garden and wondering if a really narrow bed along the fence will work. It's addictive and it may never stop. There you go, have a skinny bed and use the fence as a trellis . You could do cucumbers, beans, tomatoes......even melons (though they may require a wider bed to accommodate the root systems)! I'm looking at a tree in my front lawn that doesn't seem to be surviving the drought very well and thinking if the tree goes, that could be another veggie bed! The wife and daughter had the son-in-law build a 70' X 4' flower bed out of railroad ties. I have been warned that it is a flower bed, not a veggie garden bed. I've been keeping an eye on it to see how often they water and how well the flowers do. I can always mention the fact that it would look better with living vegetables than dead flowers. I think some beautiful pepper plants and some bright lights chard and a few other things will look nice in that dead flower bed. Like others have mentioned, it does become addictive. I live smack in the middle of New Orleans and it likely won't be long before I have little to no grass to cut in my back yard. I currently have five 45 ft. rows and am seriously considering putting in a couple of raised beds for root crops. My garden soil is great for above ground stuff but it has a fair amount of clay that tends to prevent root crops from maturing nicely. My favorite time of year for gardening is coming, but not soon enough. The summer heat has been oppressive. Fall gardening is so much easier with fewer weeds, less pests, less watering and much nicer weather to do all the chores in. Hey Gumbo, I love "smack in the middle of New Orleans". To me, that means somewhere along St. Charles so you can catch the trolley easy. I do have one important question. Do you like your gumbo creole style or cajun style? That is a gardening question because if you like it creole style, that means you are growing okra. If you like it cajun style, you have some hot peppers in the ground. Then of course, you could be in the Irish Channel growing potatoes. Okay, I'm ready to go to "Mothers" for a shrimp poboy and a small bowl of gumbo. Laissez les bons temps rouler. Here's the whole garden, before I finished adding the dirt. You can still see the cardboard. I love it. I wanna plant, but it's 100 degrees outside. And, here are my soybeans flowering! And I thought I was gonna lose these guys to bug damage, but they're flowering up a storm. Each little plant has 10-20 flowers/buds on it. If even half of those turn into beans, I don't know how those little plants will stand up. These were also the last things I planted, and boy they matured fast. I guess the giant tomato is shading them during the intense sun, so they're doing well. Actually Ted, I live in what is called Mid-City, very close to Jesuit High School. You sound very familiar with N.O. so I'll assume you know the area. To your query, I grow both Okra and Peppers. The okra plants have started putting out well. I only have 30 plants and I'm picking about 50-60 pods a day now. Matter of fact I made 4 gallons of chicken, andouille and okra gumbo yesterday for a friend of mine that owns Grits Bar. They held the City Cup Darts Finale there last night and it went over well. There was nothing to take home except the empty containers and a bit of rice that the "winged rats" (pigeons) will enjoy today. As for Mother's, 2 of my favorites are the Debris Biscuit for breakfast and the Ferdie for a more substantial meal. SO glad I'm not alone with the expansion addiction. And I haven't even really gotten much produce this year, except for greens and tomatoes. This is my learning year, next year I think I'll be more ready. I really want potatoes! Cerbiesmom, what variety of soybean do you have? From the picture, it looks as if the flowers are near the tops of the plants. 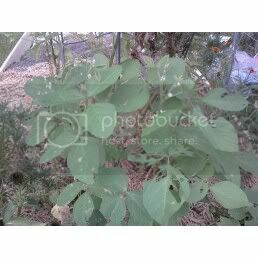 The ones I grew in my spring garden grew to about 30 inches tall, had heavy foliage and the bean pods all formed close to the main stalk, fairly low on the plant. Each plant produced between 35-50 quality pods great for edamame. I'm getting ready to put more in the garden very soon. It is a variety called Early Hakucho and will be the first time trying these. Hopefully, they will be a prolific as the last.